Bamboo products are all the rage in eco-friendly design and decor, both indoors and out. Though bamboo decking has many good qualities, it also has some notable negative aspects. Understanding the pros and cons of any outdoor deck material is important when making an educated decision about what type of material to use. Bamboo is actually classified as a grass, not a wood. Bamboo is a tropical plant that can withstand a great amount of damage and stress. However, because it is a tropical plant, it is less resistance to drastic changes in the weather, such as those in northern regions like Michigan or Minnesota. Take this into consideration if you live in an area with harsh winters and lots of snow or ice. Bamboo decking will need to be thoroughly sealed and resealed throughout its life. 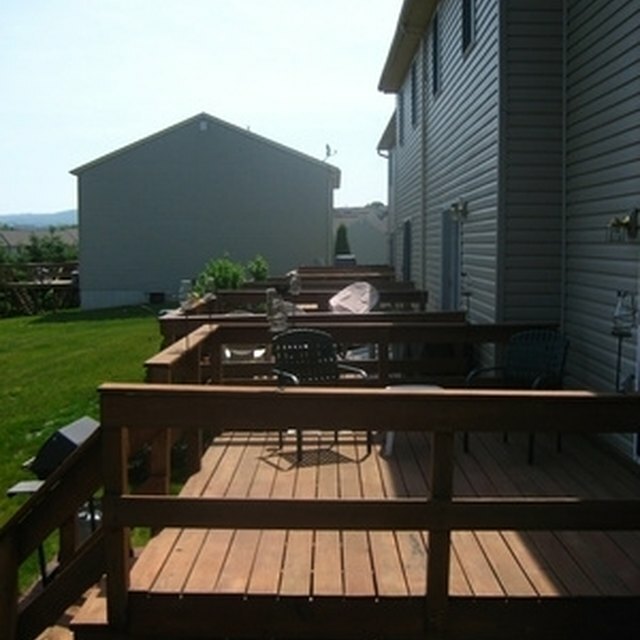 However, sealing and resealing should be done with every deck in these regions, regardless of its composition. The overall lifespan of bamboo can vary greatly based on the product. During the manufacturing process, bamboo is pulverized, boiled and then woven together. It is then sealed using a resin and pressure treated to create the plank shape. Depending on the quality of the resin, the bamboo planks could last several decades, or just a few years. Unfortunately, bamboo decking is not necessarily as eco-friendly as some may think. There are several chemicals that go into the process of making each bamboo plank, particularly the chemicals in the resins. Natural, true bamboo that has not been chemically treated in any way is easily destroyed in harsher weather, making it a poor choice for outdoor decks. Some manufacturers create ridges in the bamboo plants. While this is intended for drainage purposes, these ridges can collect dirt. The dirt can scratch and damage the finish; they can also make the wood difficult to clean. Regular sweeping is a must to remove the dirt, which can create more maintenance work than you may have anticipated. Some companies advertise bamboo composite decking, which is not true bamboo decking. Composite deck materials often contain a certain percentage of recycled materials combined with a certain percentage of bamboo fibers. Though it is not a true bamboo deck, it may be more attractive to certain consumers because it is extremely durable and will not require any painting, sealing or refinishing throughout its entire life.